What a beautiful new world we live in. In today’s cars, we take all the convenience and electronics around us for granted. Vehicles stay in lane on their own, brake and accelerate as if by magic, and park completely autonomously in a sufficiently large space. It’s not so long ago that you had to think, look, decide and react when driving. The first sensors installed as standard seem imperfect and awkward today, but are all the more likable because of that. Today we’ll carry out a little test and parallel park using an optical–acoustic park assist system from the 90s. BEEP – all systems ready, all lamps on. Parallel parking and backing up right to the car behind you within a hair’s breadth without touching it is now easily possible with six sensors, a radar or a camera. What’s more, when driving, the distance to the car next to you and in front of you is permanently measured and you’ll get a warning or the car will slow down if necessary. Back in the 90s during parallel parking, you were still relying on your own feeling, a passer-by giving you a signal, or your reflection in a shop window next to your car. Although back in the 80s Toyota fitted ultrasound-based sensors in the rear bumpers of vehicles (still called “Sonar” then), in the 90s systems with two or four sensors were often only found in high-end cars, mostly offered at a premium. Two of these things the size of espresso cups sit proudly in the rear bumper in our test specimen and are busy comparing the outgoing with the incoming ultrasound. Their data is compared in the control device – which is probably still hand-soldered if you come to think of it – and is then sent to some wonderful quirky thing that doesn’t seem to belong there. Do you know these small fan heaters you can attach to the parcel shelf? The ones you use to defrost the rear window more quickly or ventilate it? That’s more or less what the small factory-fitted lampholder looks like, which takes you right back to the age of Pac Man when you put the car into reverse. 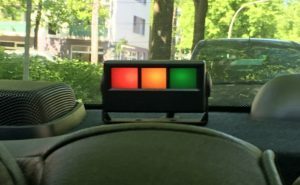 Traffic lights of red, amber and green light up briefly and signal their willingness to cooperate with a loud “beep”. You can see them quite well in the rear-view mirror, so you don’t even have to turn round. Then the lights change to green. So there’s enough space, or so the ultrasound and fan heater claim. If I roll backward slowly and get closer to the car behind me, the traffic lights switch to amber with another beep. Similar to current cars, there’ll be periodic beeps the closer you get, and then the light switches to red and the sound turns into a long permanent and annoying beep. If I’m honest, I hate that. But in combination with this sequence of color I love how retro it is.